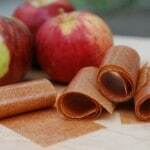 Lately, I’ve been on a bit of a tear making fruit leathers. First it was strawberry (read: Strawberry Fruit Leathers), then I tried peach and blackberry. They’ve all been big hits with my kids. I love that I can make these in the oven, no dehydrator necessary. And I love that I can control what goes in them. With apple season in full swing, it was time to try those too. After some experimenting, I think I got it just right. Wash, peel, and chop 4 cups of apples (about 4 medium apples). I used a variety of apples I had on hand. Place apples in a saucepan and add 1/2 cup of water. Bring to a simmer then cover and cook about 10 minutes or until soft. Add 1-2 tablespoons sugar (to taste) and 1 teaspoon cinnamon. Mash. Cook 2-3 more minutes on low heat, stirring occasionally. Bake at 170 degrees F (or as low as your oven will go) for 2-3 hours or until it’s tacky but doesn’t stick to your finger (you will need to check it periodically). Cut into strips. You can either place them on waxed paper or roll them up as is. Store in an air-tight container. 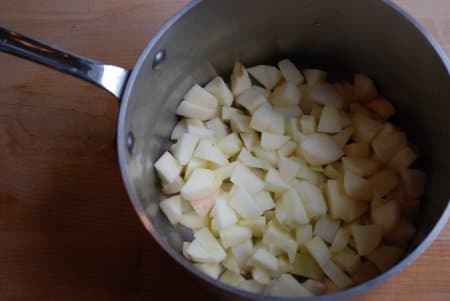 Wash, peel, and chop apples and place them in a medium saucepan. Add 1/2 cup water and bring to a simmer. Cover and cook about 10 minutes or until soft. Add granulated sugar and cinnamon and mash. Cook 2-3 more minutes on low heat, stirring occasionally. Put mixture into a blender and process until smooth. Pour onto a baking sheet lined with parchment paper or a Silpat and spread with a spatula into a thin layer. Bake at 170 degrees for 2-3 hours or until it's tacky but doesn't stick to your finger. I’d love to try this with mangos, but since we don’t have access to parchment or a Silipat, would tinfoil work? I don’t think aluminum foil would provide the same non-stick quality as parchment or a Silpat. Have you checked your grocery store for parchment? In ours, it’s in the “natural foods” section for some reason. Also, just FYI: I’ve had my Silpats for years and use them a lot–so if you’re considering getting one, it’s a good investment! 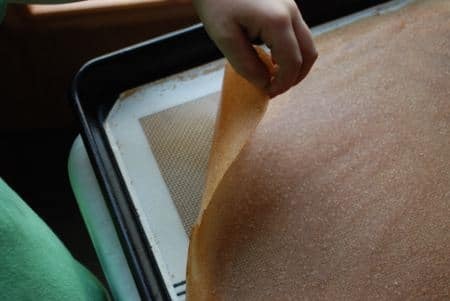 I’ve made the fruit leathers using aluminum foil when I haven’t had parchment paper handy (haven’t broke down and bought a silpat yet, but need too!). While yes it doesn’t provide the same non-stick as the silpat or parchment paper, it is still possible. Just make sure you spray it down lightly with pam or a misto filled with olive oil, and be careful when pealing the foil off. With Using the foil though, it will cook a bit faster, so just keep an eye on it. 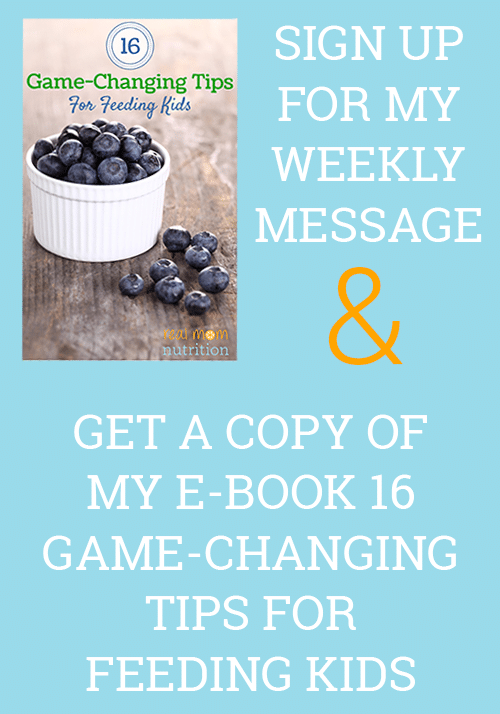 Good to know–thank you Evei! Ok, your photos are beginning to look magazine-caliber. Have you gone back to school for photography? That top one is killer! 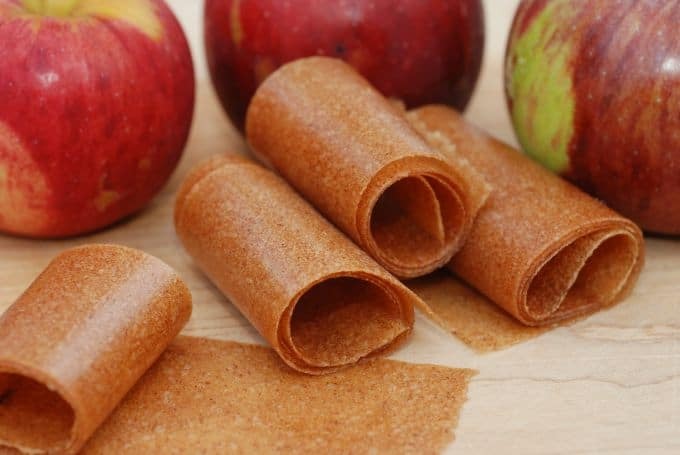 The apple-cinnamon roll-ups sound great and I would love to try making them. 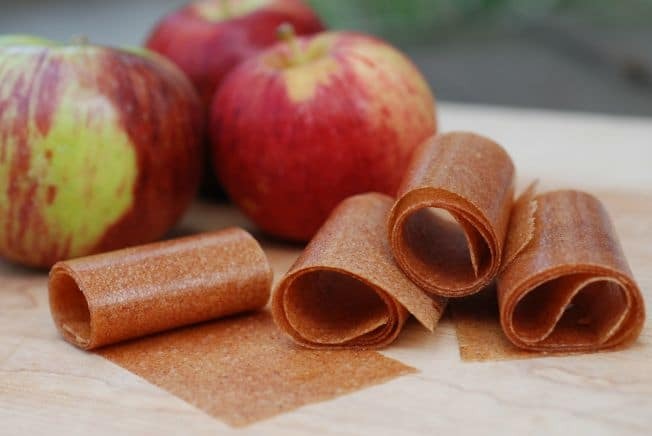 I am a little gunshy since my one attempt to make fruit leathers (awhile ago) was a flop–and an expensive one at that!! Please reassure me that this is easy and they will come out perfectly!!! Thanks Stacy. You are too kind. But really, I give all the credit to the nice camera lenses! I’m sorry you’ve had some fruit leather flops. I think the trick is to get it very thin and even on the baking sheet and then to check it regularly while it’s baking. Leave it in too long and it will get crispy, take it out too soon and you get mush. If you try this recipe, please let me know how it turns out! Glad to hear it Katie. Thanks! Made these today, they were pretty easy & came out ok. Mostly done just right but I guess 1 side was thicker than the rest & didn’t dry enough so was too soft to roll up. We just ate it up. But it seemed like a lot of work for about 10 skinny strips of fruit leathers. 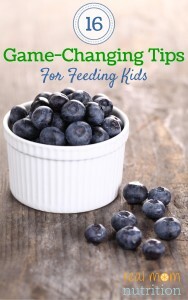 I think it’s just easier for me to have my kids eat sliced up apples! Maybe if I got a bunch of apples for free I would make again but I wouldn’t go out & buy apples for these. Thanks for sharing tho, it was interesting to try making them! Banging the baking sheet on the counter a few times helps to even out the mixture so you get an even thickness all over. They are time intensive but once in a while they are nice as a special treat. I don’t buy regular Fruit Roll Ups so this is fun for my kids. Thanks for letting me know how it went! I have two apples trees that are always filled with apples. My work crew (kids) are gone now, so am really happy to have this recipe for fruit leather. Not sure I’d make leather if I had to buy apples. But these are free–still time intensive, however. But any kind of cooking is. 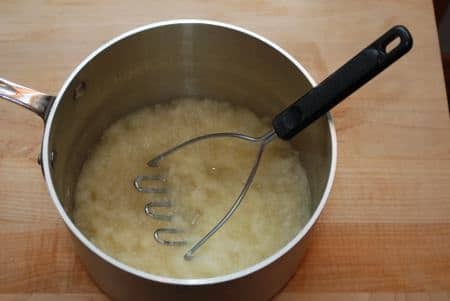 Just a question–is the texture of this mixture similar to applesauce? Yes, kind of like very smooth baby applesauce. Depends how long you leave it in the blender. 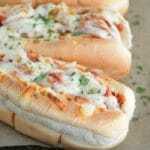 I don’t have parchment paper… Can I use wax paper? No you shouldn’t put wax paper in the oven. You can get parchment at the grocery store (in mine it is stocked with the natural foods of some reason) or better yet invest in a Silpat baking mat which you can use for lots of stuff (including cookies) and can be washed and used again and again. Hi! I am currently trying your recipe. How long does the apple leather keep? I suspect it will not last long in my house, but I was thinking about making some for my sister as part of her Christmas gift. Thanks! Megan–it lasts a few days in a covered, airtight container. This ended up being a huge waste of time and money. Parchment stuck to the leather. After researching the Internet I discovered other blogs say NOT to use parchment because it will stick. Also it took 5 hours not 1 or 2. Which I also discovered is more common while reading others bogs about fruit leather. That being said I do love your blog and the leather smelled delicious! I will be trying it again without using parchment. Lesley–so sorry to hear you had trouble. Thanks for letting me know. Do you own a Silpat baking pad? That worked very well for me. As for the time difference, my recipe says it will take 2-3 hours–but your mixture must have been thicker if it took five. I spread it so you could *almost* see the pan underneath but not quite. Hitting the pan a few times on the counter really helped as well to distribute the mixture evenly. 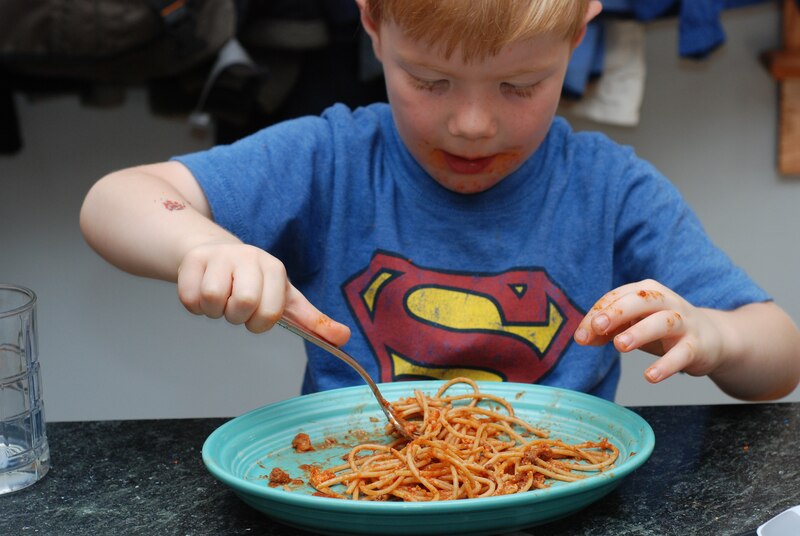 Glad you like my blog and hopefully you’ll have better luck with some of my other recipes! Using the quantities as the recipe said, it did take five hours, because the amount of sauce it gave didn’t allow us to “almost’ see the pan. Lily–Thanks for the feedback! If you make it again, you may want to cook down your mixture a bit more on the stove to reduce it further. Fruit leathers are very tricky and everyone’s ovens are slightly different, so it’s not an exact science. My second round, I used parchment, found that a little spray of cooking oil on the paper worked wonders. Everything went well except my rollups are still sticky. Not bad but not like the ones you buy at the store. Makes it tough eating them for lunch when you are out in the field away from water. any suggestions? I would think it should work since it’s apple puree, as long as it’s very smooth. 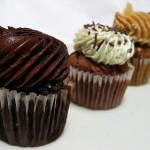 Would grease-proof baking papare work? Hannah–is baking paper the same as parchment? If so, it should work. Though the Silpat baking mats do work the best! A silly question: 170 degrees Fahrenheit or Celsius ? I reckon you’re supposed to dry the apples not bake them, but according to recipe… my oven goes down to 50’C (120 degrees Farenheit) and I’m sure it’s gona take 5-8 hours to dry anything. I’ll be grateful for clarification. It’s fahrenheit–thank you for pointing that out, I will add that (important!) detail. I made this with apples from my neighbour’s tree. I did not peel them (hello, they get blended) and I added a pinch of allspice to the mix which really kicked it up a notch. Delicious. Thank you for that comment. I was gifted about a bushel of small to medium crab apples and I was researching how to prepare them without peeling. These are beautiful tart crab apples, hardly a blemish on them. So I washed them; cored them; added about 1/2 to 3/4 cup of water to the bottom of the 6 quart kettle. Cooked them till the skins were soft; then blended them and placed them in the dehydrator. I tasted along the way and they are tart, but that is the way I like crab apples. I will make a comment here once they are done, but as you said the skins blended and unless I would know, I couldn’t tell that the skins were left on! The leather turned out smooth. It is tart, but I don’t like to add any sugar to leather. In the future, I could try using some other fruit to give it sweetness. These look great! Can these be made in a dehydrator? Hi Emerald–I’ve never used a dehydrator, so I don’t have instructions for that method but I’m sure you could. I noticed that you used honey for the strawberry fruit leather. Is there a reason why you use sugar over honey for the Apple ones? And do you think honey would work? 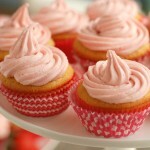 Hi Nicole–I have used both honey and sugar for the strawberry and think both turned out. So I’d pick whichever sweetener you prefer. Hello, can I use a silicone baking sheet to make them? I mean I am trying it anyway as I can’t get out today and wanted to make a healthier fruit roll up for my son. oh yeah also forgot to ask, is this recipe for one layer or 2 because it went on pretty thick, I have my fingers crossed it was for one lol!!! Hi Carolee–I recommend a silicone baking mat such as a Silpat. And it is one layer. If it’s thick, it will just take longer to dehydrate. 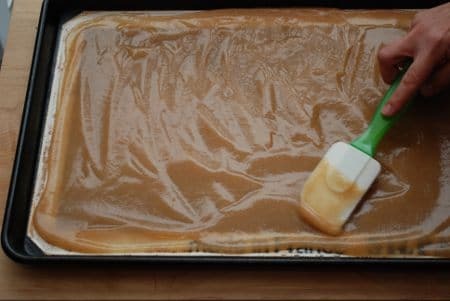 Make sure the layer is even by holding the sheet firmly with both hands and whacking it on the counter a few times before placing it in the oven to even out the mixture. Good luck and hope you like it! oh lol I had no idea a Silpat was silicone lol sorry about that…so great news they turned out pretty great 🙂 thank you for this fun recipe. And for mine it took between 4 1/2 to 5 hours but its all good i just did my stuff around the house while they were ready. I am NO LONGER buying fruit roll ups from the store, now I know whats going into my sons snacks. Thanks again and I look forward in trying other flavors. I’m so glad it was a success for you! 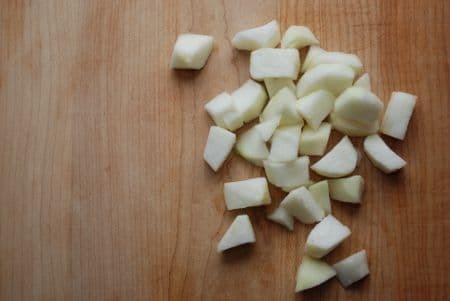 I didn’t peel my apples since my Vitamin liquifies anything anyway and it imparts more fibre to the finished product, additionally, I didn’t use anything to sweeten the mixture as all forms of sugar are dangerous to one’s health, the apples are sweet enough, even if they don’t taste that way.